Women experience heart attacks very differently from men. 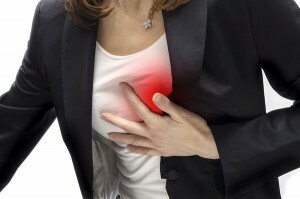 The crushing chest pain with pain shooting down an arm and shortness of breath that we often see as portraying a heart attack is not what most women experience. Because of this many women overlook the symptoms they are feeling until it is too late. So what symptoms should a women pay attention to and seek help immediately? The top five symptoms are: Heat (feeling hot), Exhaustion (not having the energy to walk across a room), Pain, Paleness (looking colorless), and Vomiting. Other symptoms can include: jaw pain, toothache, headache, nausea, heartburn (that won’t go away), sweating, and arm pain. Also remember any chest pain will be a dull, squeezing pain rather than sharp or stabbing pain. If you experience any combination of these symptoms (especially the top five) seek medical attention immediately. Treating a heart attack as early as possible is the best way to prevent serious heart damage and even death. These symptoms are especially important for women who have risk factors for a heart attack. There are a number of risk factors that can lead to a heart attack: high cholesterol, high blood pressure, family history of early heart disease, smoking, being overweight, poor diet, diabetes, and a sedentary lifestyle. The good news is that most of these factors can be changed to decrease your risk of heart attack. Here are eight things you can start doing to decrease your risk of a heart attack and improve your overall health. Get Active. The number one thing is to move. That means walk, run, dance, or any activity that has you up and out of a chair for at least 30 minutes per day. Get a fitness tracker to track the number of steps you take to nudge you to keep moving. Improve Your Diet. Reduce the junk food and increase the fresh fruits and vegetables. Add more beans and low-fat proteins. Reduce red meat. Increase fish in your diet to get the omega-3 fats. Also increase plant-based fats such as avocados, olive oil and nuts. Cut out trans-fats. Start keeping a food journal to check yourself on what you are actually eating. Stop Smoking. If you smoke, seek help to stop. This one thing will improve your health tenfold. It’s never too late. Alcohol. Limit alcohol intake to one drink per day. Be a Healthy Weight. If you are overweight, work on losing. Even a small reduction in weight can reduce your heart attack risks dramatically and help control cholesterol and blood pressure. Get Enough Sleep. Not getting enough sleep adds stress to your systems. Your body needs time to repair and restore. Try for 7-9 hours per night. Reduce stress. Sometimes this means reducing frustration which often leads to anger. Keeping your body in stress mode stains the heart. Give your heart a break. Try calming activities such as meditation or prayer. See Your Doctor. Go to your doctor for an annual screening. Have your blood pressure, cholesterol, and hgbA1c (if diabetic) checked. Work with your doctor to change habits or medications.